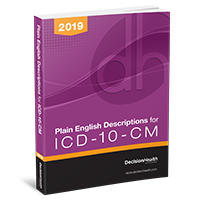 The 2019 Plain English Descriptions for ICD-10-CM is the ultimate reference tool for all coders and clinicians that may encounter coding terms while reading medical documentation. With accurate coding comes payment in home health, and this tool is a must for all coders! Plain English Descriptions for ICD-10-CM codes and categories — Increase coding accuracy with added clarification. This book provides coders and clinicians with comprehensive clinical, coding and documentation guidance. Detailed anatomy illustrations — Better interpret clinical notes and code with greater specificity. Numerical arrangement — Easily find the information you’re looking for. This book mirrors the arrangement of the official ICD-10-CM code set for easy identification. Diagnostic syndromes — Understand what symptoms and/or diseases are included in a syndrome. Prefixes and suffixes for commonly used medical terms — Boost coding speed and accuracy by overcoming any unfamiliar terms in the medical record. 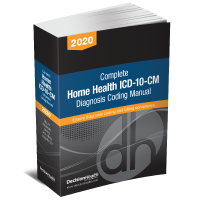 100% Money-Back Guarantee: If you don't agree that Plain English Descriptions for ICD-10-CM, 2019, helps train you and your coding staff in ICD-10, return your purchase within 30 days from receipt for a full refund; no questions asked.